Life can get pretty crazy here at HQ. With a tall skinny house on a long skinny lot, there’s a whole Micro Farm fit in this little footprint. There’s us two adults plus our progeny, two big boy dogs, two lovely lady birds, a humble food forest, and about a billion beautiful house plants. That’s a whole bunch of life in not so much space! I get a lot of questions about keeping urban chickens and how we manage to do it, given our limited acreage. So today, I present a guided tour of the girls’ room . . .
We built a run down the side of the house, so they can always access a place to scratch and bathe and play. Using scrap wood and old wire and repurposed roofing, we got the job done with barely a budget. About a third of the space is covered – the area closest to the entrance, where the raised box sits. This offers protection from the rain (or snow). But the rest is nice and open, bounded only by mesh to keep the predators away. Damian built ‘the winter box’ to keep them warm last snow season, and it sort of stuck around. Their food and water sits on a small shelf inside. They lay their eggs in there, but given the choice they’ll never stay overnight. It’s raised off the ground because our pet chickens have pet rats . . . that’s another story. The little door in the front is just for them. The whole roof lifts on hinges, and that’s how we access their food, water, and eggs. It’s an incredibly simple design that Damian conceived of and constructed in a weekend. It works like a charm! Did you know that wild chickens (jungle fowl) are tree birds? It’s true, they actually don’t like to sleep enclosed. 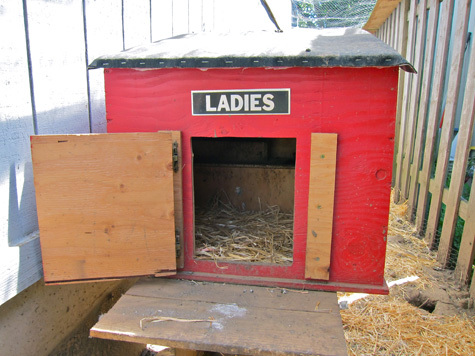 When I learned this I was determined to give my girls a comfortable place to roost. In the picture above you can see their ‘tree’, which we built out of a hedge we’d cleared. A couple of hefty branches and the old screw gun, and our ladies were sitting pretty, sleeping perched each night at the highest point. The hens spend their days free ranging the yard. This spring we built a fence to separate my garden from their grazing . . . which I was ever so grateful for. It’s been a wonderful summer of plucking slugs from the old potato tires and dust bathing under the plum tree. Seeing them living and loving it out there every day, it just brings me endless joy. I can’t imagine HQ without them! I plan on getting a couple of hens myself in a couple years; what breeds are they? AHHHH I miss my chickens so! They’re so funny, and WAY more intelligent than most folks give them credit for. I built my coop snake proof, pit bull proof and foster dog proof…but not Maverick proof :( My foster dog had 3 hours outside and tore through 1/2″ hardwire mesh (same stuff you have above). Who would have thought my littlest, most fearful foster dog would be the one who annihilated my coop and 5 hens? :( I suppose I share this so that as things change for you, keep an open mind on future predator proofing. 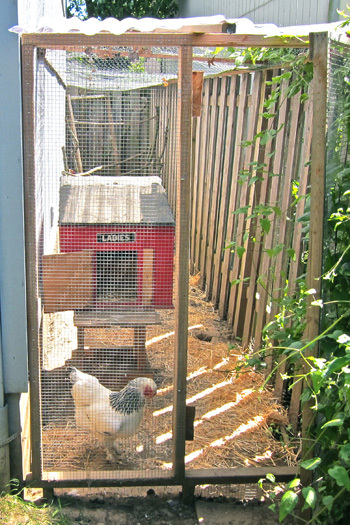 Did you cement the mesh on your coop into the ground? I didn’t, but I thought about it. 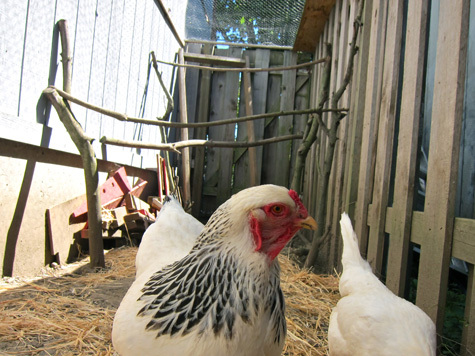 @Brittany – backyardchickens.com was an INCREDIBLE resource for me. Great people, lots of ideas! And you’re not afraid of them flyin’ up over your fenced yard? 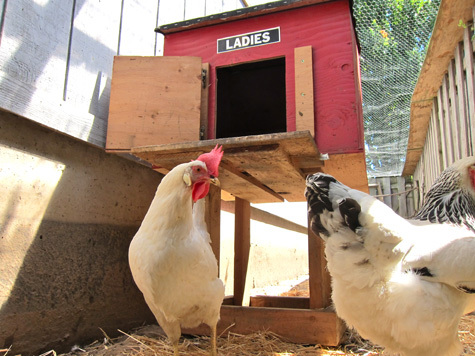 Your ladies look so happy – I can’t imagine not having my 5 lovely hens! Isn’t it wild how far up they roost? The first summer we had our girls, we couldn’t figure out how they were getting over the 6 foot fence. They were roosting so high in the trees that when they flew down in the mornings, they landed outside their enclosure. We’ve adopted a goat and are putting the finishing touches on her space before we bring her home. I think my micro farm is quickly becoming a micro farm sanctuary. What a lovely set up! Awww, this make me miss my chickies :( We used to keep a couple when we lived in Austin, but we had to give them away when we moved. Nobody believed me when I said they like to roost up high! Have you ever had to tell ‘the story of the rooster’? Otherwise highly intelligent people don’t understand how we can get eggs (but no chicks) without a rooster… lol. @Sarah ‘the story of the rooster’ ended up being the perfect way to introduce facts about reproduction to my toddler. Also, it helped her understand the difference between fertilized and unfertilized eggs – otherwise, she probably would have had nightmares after the first time she saw one of our hens eat one of their eggs! I am such a lurker of other’s coops. When they free-range the yard during the day, is there ever any fear from other wild animals getting to them? It’s always been my fear with our hawks and raccoons. @Eden We lost one of our girls to a predator literally a day or two before we figured out how they were landing outside their coop in the mornings – so we moved their fencing outside of where they were landing. I worry about aerial predators, but their coop includes a very large tree and stand of bushes, which is where they often take their baths. Luckily, they don’t wander down their very long run unless we are out on the grounds. I have neighbors who have lost birds to both hawks and raccoons, so we trade advice often. @Eden: We had lots of hawks and such, but the girls seemed pretty good about avoiding them. We have owls, foxes, snakes, etc. where we live now, but they seem to not bother the chickens in the area. Dogs, on the other hand, tend to take delight in terrorizing them. We didn’t have dogs ourselves, but the neighbors here do. I know my family out the country keeps the running around all day, and they mean business when they are tracking down an animal (fox, snake, bird, whatever) that’s been hurting the chickens or the eggs (or whatever else). They always say they have to develop a taste for the chickens-they usually prefer their more natural fare. maybe a naive question, but what do you do with them in the winter??? im in denver and worry about them freezing to death in the winter. many friends out here have a garage to relocate for the couple of really cold days, but we don’t have any space. anyone have ideas or knowledge about this? @Amanda: I’m in NC, so it rarely drops low enough to be dangerous for our hens. We still heat their coop, though, and keep their space clear of snow so they’re as comfortable as possible. There are a lot of great online resources, I think backyardchickens.com has already been cited. Forgive me if you have addressed this (I skimmed today’s post and am nursing a bum back and neck with a heavy muscle relaxer (a blessing and a curse..gotta love it! ): What are your reasons for having chickens? Pet purposes? I would want them for fresh eggs (I am only ok with eating eggs if I know the chickens have been treated properly…thus, I eat VERY few eggs) However, for vegans (and veggies who don’t eat eggs) I am curious as to the reasons to have chickens. @Rebecca – If you can sit and enjoy the silly antics of animals who wonder nothing more than ‘what’s that shiny thing and why can’t I have it? !’ then you should get chickens. @Ero San: I’ve never seen one of my hens break an egg intentionally, but we’ve dropped them in their coop accidentally from time to time and boy oh boy, they go nuts to get to the yolk, and one hen in particular, Hedda, always runs off with the shell. We also have a really broody hen and she gets distressed when an egg breaks, so we don’t intentionally feed them their eggs (which I think some owners do, to return some of their nutrients back to the hens). @Rebecca: We adopted our hens from a local egg farmer who didn’t have room for them and was going to raise them as broiler chickens – long story short, we took as many as we thought we could care for right off the bat, on very short notice. We compost their manure and let them tend to the garden, but mostly we got them because they needed a home and as companions for our daughter. What better way to learn about animal stewardship and about what is sitting on her grandparents’ plate? Also, my husband is not vegan, and we agreed that when the girls started laying, he would get some of the eggs (he hadn’t eaten any eggs in years) and we would give the extras to any nearby relatives. My daughter eats the eggs from time to time, too, and she understands why those are the only eggs we ever bring into the kitchen. We’ll definitely get more chickens, but we aren’t concerned with their age or whether or not they’re still laying. However, taking the chickens off the hands of a farmer so that he has room to raise more chicks…that’s another issue altogether. I’d love for my daughter to raise some chicks of her own, but unless we get a rooster of our own, that’s not going to happen! I have some friends with chickens in central New York, they heat the coop in the winter. Oh they are lovely! And am so happy to see we have the exact same breeds of chickens… great minds and all that jazz! We have a pair of white leghorns (Roberta & Starbuck), a pair of light brahmas (Chatty Cathy & Blanca), and a lone golden laced wyndotte. My life wouldn’t be complete with out my feathered ladies. @ Brittany – Thanks, they are so dang delightful. =) Petunia is a standard leghorn (small, scrappy, and very vocal) and Princess is a light Brahma (giant, shy, and raptorial). You can read their whole story here. @ Kate – Luckily the predators are less prevalent here in the middle of the city. We get infrequent raccoons but the mesh keeps them out. Dogs are the biggest threat – including our own! We have to be careful about that for sure. @ Tenise Rae – They are not stinky at all! And actually one time a few years ago, within the first few months putting them outside, Petunia did fly over the fence. It was hysterical actually – something spooked her and she shot up and over the fence before I think she even realized what was happening. She landed on the other side with this look on her face like “WTF< where am I and how did I get here? ?” Damian does a great impression. It was pretty damn funny. But we’ve never had that problem since and I don’t worry about it! @ windycityvegan – Yay micro farm sanctuary! I love it – actually it’s a dream of mine. 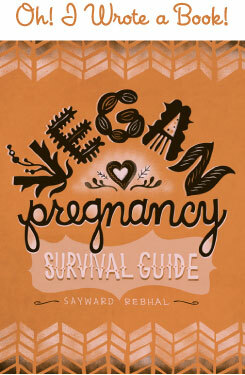 I love all your thoughts on raising chickens and raising children and being a vegan with animals, etc. Thanks so much for sharing! @ Eden – Really depends on where you live (as others have said). Here in the middle of the city I don’t worry about raccoons or hawks, but I do worry about a neighborhood dog breaking through the fence. I know people who have lost chickens like that. But, what can you do? We do have a collection of kitties who drive themselves mad stalking our ladies, who couldn’t care less about the felines who’re smaller than they are! @ Rebecca – We got our first girls before we went vegan, so at that point is was a mixture of a. I love chickens (was raised with them!) and b. for eggs. But even as a veg*n I’ll keep chickens as long as I can (rescue only of course). My reasons are simply that I adore them, they make wonderful little companions and I think my kid(s) will benefit from growing up with animals, and of course because rescue chickens need good vegan homes! @ Amanda – Isn’t it interesting how the personalities are so distinct between the breeds? I really want to take on a third girl at some point (we’re allowed three within city limits) and I can’t decide between an Araucana (blue eggs!) and a golden girl like a Red Star (so classic!). Awww, I just love chickens! Araucana is on our list for the next batch of little ones. Or any easter egg layer. Is your brahma a gentle giant? Our two are the sentinels of the flock. Chickens = easier to take care of than dogs, and they just keep giving us lovely eggs! Several of the comments above have worries attached to them. Chickens are very easy and fun to care for if you provide them with the proper housing and care. For example egg eating is a very rare occurrence if the hens have proper nutrition which ensures strong egg shells and a nest box designed correctly for them. Both of these things will prevent broken eggs, which is the beginning of any egg eating. As for winter safety, again housing design is critical. Chickens can take a LOT of cold, but must be kept dry and draft free. I found a tremendous amount of information on http://www.uBuilderPlans.com website. Plus info on Urban gardening. I hope more of you decide to take the backyard hens plunge. I have had them for about 40 years! So I dont quite understand, do you eat eggs? This to me doesnt seem like animal exploitation. So if you did eat their eggs is there any harm? If you dont eat their eggs why do you have chickens :) Im not vegan and until about six months ago I wasnt even aware of what factory farming was. Im still learning and trying to process everythign I have learned to see what works for me and to gain some rational on the subject.